The environment on the earth’s surface is degrading day by day; with the use of plastic increased from the last 2 decades making the life on earth is being unsustainable. Due to this we have proposed a plan to use the waste plastic material as aggregate for the concrete and provide a new aspect to the construction industry. Recycled plastic aggregate can be used as an alternative to produce a lightweight concrete which makes low impact on the environment. Since PP (polypropylene) is the least recycled in the post consumer plastics. In this study we have focused on the waste EPP aggregate that can be used as a partial replacement of the natural aggregate for the production of the lightweight cement based composites. First of all, EPP and natural aggregates were examined and the coagulated silica was characterized with the help of SEM, XRF, EDS or particle size distribution or the pozzolanic activity. Microstructure of the lightweight concrete is analyzed using the optical microscope, EDS and SEM imaging. Basic physical, mechanical, and hygric properties are examined for the development of the lightweight concrete. Special care was taken of the thermal properties for the development of the lightweight concrete. Using this technique, sufficient mechanical resistance, whereas the thermal insulation performance was markedly improved which the results show. The developed material was found relatively better for the non-structural applications in the construction industry. It allows the development of the buildings with using optimum energy performance as well as reducing the ever-growing environmental impact of the waste plastic as well as saving the natural aggregates. Silica sand synthetic coagulated amorphous SiO2 pot water and EPP aggregates which replaces the 60% by the volume of the silica sand. How much EPP will be used depends on the basis of the preliminary tests. To achieve good workability, a super plasticizer – Dynamon SX was used. 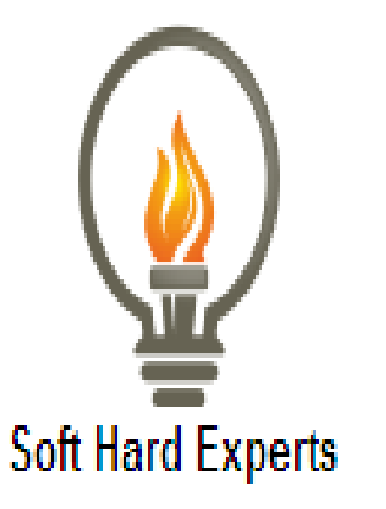 The natural aggregate silica sand is mixed from 3 sand fractions in weight ratio of 1:1:1. The water cement ratio for both of the examined mixtures was 0.5. Since ultra lightweight aggregates have a tendency to float, it can result in a poor mix distribution and segregation, silica VP4 was added to the mixture. Silica VP4 acted as an admixture for improvement of the dispersion of the EPP particles in the cement matrix as a pozzolan. The casted samples have dimensions of 40x60x160mm, cubic samples have a dimension of 70mm and the flat cylinder samples were having the diameter of 100mm and their thickness was of 30mm which were left for 1 day at the lab conditions, and after that they were unmolded and were cured for 28 days or 90 days from water, which has the temperature in the neighborhood of 23­­o ± 2o C.
Tested Reference (left) & EPP (right) concrete samples. The characters of the natural and plastic were taken in terms of particle size, matrix density and in particular of the thermal transport and storage properties, which are dependent on powder density and material compacting. The analysis of the grain size was seen during standard sieve method with sieves of the following mesh dimensions: 0.063; 0.0125; 0.25; 0.5; 1.0; 2.0; 4.0; 8.0; 16.0; 31.5 and 63.0 mm. For the property of the thermal performance assessment of both natural and thermal properties which are namely thermal conductivity λ, volumetric heat capacity Cv and then the thermal diffusivity were measured on the dependence of the compaction time. During these test, the aggregate is compacted using the vibration exciter when they are put into the graduated cylinder. The powder density is determined from the known mass of sample in cylinder and its volume. Aggregates’ thermal parameter is measured using the commercially produced device ISOMET 2114 which works on the principle of the transient impulse method. The Natural and EPP aggregates’ measurement is taken with the help of needle probe impressed into the graduated cylinder with the compacted aggregates was applied. The accuracy for the volumetric heat capacity was 20% of the reading + 1 X 103 J?m-3?K-1. The microstructure of the EPP particles was studied using the DINO-LITE digital optical microscope which has a resolution of 5Mpx. X-Ray fluorescence analysis was used to investigate Silica VP4 using an axios sequential spectrometer (WD-XRF) which was equipped with a Rh anode end – window X-RAY tube which is fitted with a 50µm beryllium window. The morphology was studied using the SEM (SCANNING ELECTRON MICROSCOPE) with a FEG electron source. For elemental composition and mapping, EDS (energy dispersive spectroscopy) is done using analyzer X-MaxN with a 20 mm2 SDD detector and AZtecEnergy Software. Particle size distribution was determined by an Analysette 22 Micro Tec Plus device which works on the principle of Laser Diffraction. This device used green laser for the measurement of finer particles and it uses red laser for the measurement of the bigger particles. Matrix density is accessed by the helium pycnometry and Blain apparatus is used as to investigate the specific surface according to the standard EN 196-6. The powder density is evaluated as well. Modified Chapelle test is used to determine the pozzolanic activity (French norm NF P 18-513). The method is based on the principle of the reaction of 1g of tested powder material with 2g CaO in the water kept for 24 hours at the temperature of 80o C. The result is expressed in mg Ca (OH0)2 fixed by the 1g of the sample and give straight information about pozzolanic activity. The minimum amount of Ca (OH)2 fixed by a material should be about 650 mg?g-1 to consider it as the pozzolanic. 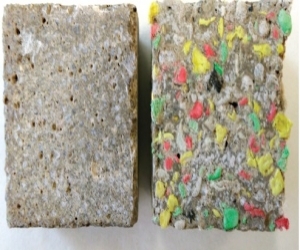 This paper has reported the results of an experimental assessment of the properties of lightweight concrete prepared with expanded polypropylene waste aggregate. The EPP allows us to make similar lightweight concrete as EPS. Generally, for producing lightweight concrete, the selected waste material plastic decides, among other things, the final density, mechanical resistance & thermal properties which are required. EPP aggregate led to significantly higher strength due to its better embedding in cement matrix when compared to HDPE and fibre reinforced PP. Following conclusions can be drawn based on the results obtained and discussion presented. The workability in terms of flow measurement decreased only about 7% of the fresh concrete mixture with EPP aggregates when compared to the (reference) mixture. The problems with the poor distribution of the EPP particles and segregation were solved totally when we added Silica VP4. The use of EPP aggregate in concrete composition resulted in the increase of porosity whereas significant decrease in the matrix density and bulk density, of hardened concrete. The developed concrete with incorporated EPP particles can be classified as lightweight concrete which is based on the bulk density value. 90 days compressive strength showed reduction to about 40%, modulus of elasticity to about 45% and flexural strength decreased about 55%, when compared to the referenced material. 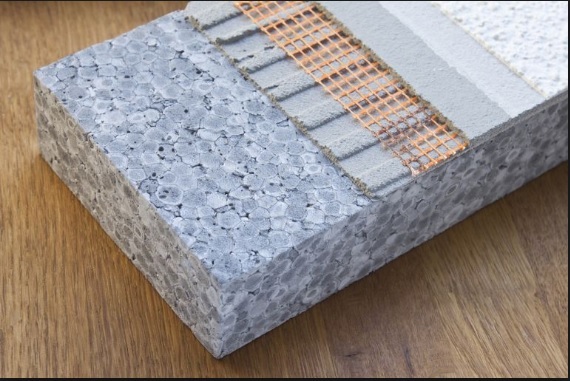 Mechanical resistance of EPP particles mixed concrete is sufficient to use in non-structural applications, like; for building subsoil or multi-layered floor structure or as the core of the sandwiched panels for prefabricated enclosures. Lower heat transport parameters are exhibited in the EPP particles than the Silica Sand. Great reduction in the thermal conductivity is seen in cement based matrix when the EPP is incorporated. Presence of moisture distinctly improves the thermal insulation properties of the examined lightweight concrete. 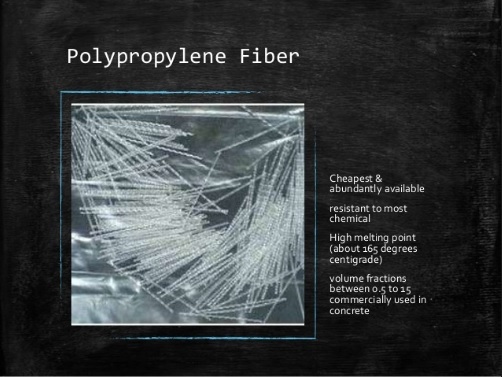 Porosity is closely related with the hygric parameters of the developed material with the plastic aggregate as well as with the plastic impermeability for water. Therefore, the coefficient of the water absorption is slightly increased as compared to the reference material. In terms of water vapour transport parameters, the water vapour resistance factors of EPP concrete has decreased to 51% of its value for the concrete without EPP for dry-cup measurement and 54% for the wet-cup arrangement. EPP concrete samples exhibited higher sorption capacity in comparison with the reference samples from the water vapour sorption capacity’s point of view. If we summarize the main outputs of the presented work, on can conclude by saying that the recycling of the waste plastics for the construction industry is quite promising alternative to reduce the impact on the environment in terms of the natural resources, energy consumption and waste disposal. However, the development of the lightweight concrete is a very suitable material for the improvement in the thermal stability of the buildings.